As the “Confederate flag” issue becomes sillier and more politically correct every day, I stare in amazement at those whose ignorance of history is exceeded only by their burning desire to be seen as tolerant and fair and loving of all peoples, to do whatever is necessary to NEVER be associated with that most evil of evil words, “racism.” As our elected leaders in Washington and various state capitals clamor and conspire to attack a rectangular bit of fabric, it occurs to me that perhaps they should at least be attacking the correct rectangular bit of fabric, the real Confederate flag, pictured above. 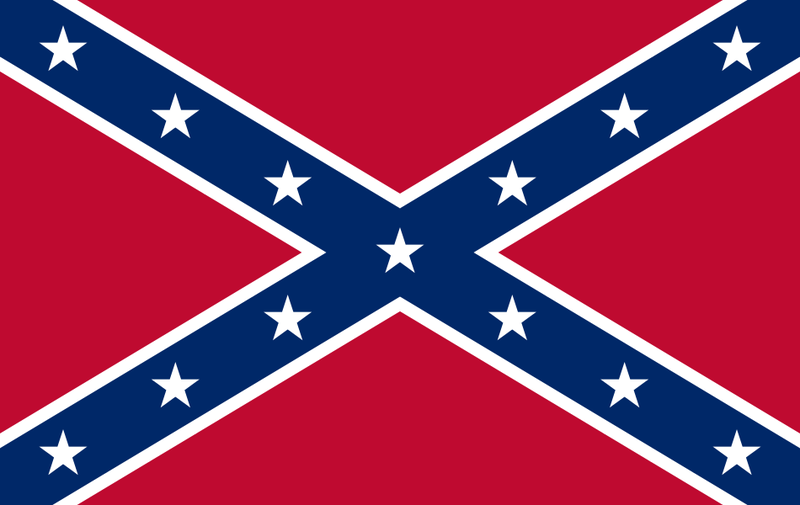 This was the official flag of the Confederacy. 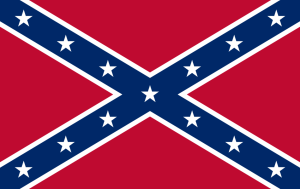 I wager to guess that almost none of those bemoaning the horrors of slavery and the evil Confederacy would recognize it as the true symbol of the south and the Confederate States of America. But, let’s not allow the truth and accuracy to get in the way of a politically correct crusade against the boogeyman du jour. As the beltway empty suits strut to the nearest microphone, declaring in their most righteously indignant tones the perceived sins of a people 150 years removed, their descendants are being demanded to beg forgiveness. That’s the ticket. That should ring up some black votes. Pictured below is the flag they are protesting and banning. It was never the flag of the Confederacy. 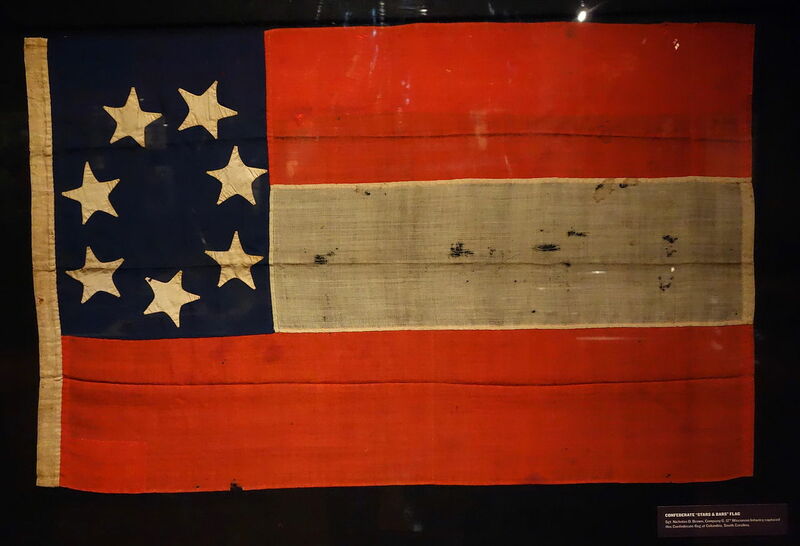 Rather, it was the battle flag of the Army of Tennessee. It has become popular in the contemporary south as a symbol of southern pride. So, THAT is what is actually being protested, the modern American redneck, cloaked in the easy target of southern slavery. The empty suits conveniently forget that slavery existed in the north as well. OK, I’ll give them the benefit of the doubt – there is nothing wrong with their memories. They are actually that ignorant. In fact, the north was the ONLY place that slavery legally existed after Lincoln’s Emancipation Proclamation. But, again, let’s not let the truth get in the way of a righteous flag-burning. There’s a lot of political capital to be made there by those without a conscience and/or a clear, proper, and unrevised preparation in true American history. After just two minutes of floor debate late Tuesday evening, the House passed a measure to prohibit the display of Confederate flags on graves in federal cemeteries. Despite the lack of fanfare, the vote marked the House’s first entry into the debate over removing the Confederate flag from federal property that went beyond codifying already established policies. Rep. Jared Huffman’s (D-Calif.) amendment to the 2016 Interior Department spending bill seeks to end a policy that allows a temporary display of the flag in cemeteries under the jurisdiction of the National Park Service. It sailed through on a voice vote after minimal discussion on the House floor that encountered no opposition. The final vote on the Interior bill is expected on Thursday. National Park Service Director Jonathan Jarvis issued a directive in 2010 that allows national cemeteries that commemorate a designated Confederate Memorial Day to decorate the graves of Civil War veterans with small Confederate flags. The directive states that decorative flags must be removed “as soon as possible” once the Confederate Memorial Day is over. “We can honor that history without celebrating the Confederate flag and all of the dreadful things that it symbolizes,” Huffman said. The flag has faced heightened public scrutiny in the aftermath of the shooting at a historically black church in Charleston, S.C., that killed nine people. The alleged shooter, Dylann Roof, reportedly told law enforcement he wanted to start a race war. Photographs of Roof posing with the Confederate flag in an apparent online manifesto have also since surfaced. Earlier Tuesday, the House adopted another amendment authored by Huffman to codify a new National Park Service policy by prohibiting new contracts to sell items featuring the Confederate flag in gift stores. The National Park Service announced the policy days after the June 17 shooting to prevent the sale of stand-alone items with the Confederate flag in gift shops or bookstores. However, it would still allow stores operated by the National Park Service to sell educational items like books or films that include images of the Confederate symbol. A third amendment to the Interior Department spending bill, offered by Rep. Hakeem Jeffries (D-N.Y.), bans the National Park Service from buying or displaying Confederate flags unless they are used to provide historical context. As with the two other amendments, it passed on a voice vote.